With just 10 weeks before the Braves’ first pitch at the new SunTrust Park, Cobb officials are expressing concerns on whether everything will be ready. Cobb Commission Chair Mike Boyce has warned that the county could not afford any missteps. The Chairman in January named a 28-member joint task force for the Braves stadium with the aim of making the ballpark a success. The task force will be an advisory body under the auspices of District Commissioner Bob Ott, who represents the Cumberland area. Ott put forward a list of 28 names of private individuals, public officials and employees of the county, as well as business owners. The Braves revealed the first facet of their traffic plan last fall, returning the starting time of games to 7:30 p.m. and noted the 14 primary access points to SunTrust Park, which will open in April. In a mid-January briefing, the Braves and key partners unveiled Cobb County’s Transportation Management Plan. Also announced were additional game day parking spaces, a Braves-operated game day shuttle, the launch of A-List season parking sales and new partnerships with Uber and Waze. Last fall, the Braves and their partners – Cobb County Department of Transportation, Cobb County Police Department and Kimley-Horn – provided an overview of the collaborative approach to transportation management where they shared plans to return the starting time of their games to 7:30 p.m. and detailed the benefits of the 14 primary access points to SunTrust Park, which will open in April. The Cobb County Transportation Management Plan outlines the community’s strategic approach to managing vehicular and pedestrian access to SunTrust Park. In crafting the plan, Lieutenant J.D. Lorens said the county focused on minimizing the impact of traffic on daily commuters by utilizing the 14 primary points of access to ballpark. The Cobb County Police Department will have uniformed officers at approximately 30 intersections around the ballpark to help support game day travel. Combined with a variety of access enhancements in the surrounding area, such as the utilization of contraflow lanes – reversing the traffic flow of designated lanes before and after games – and the construction of a dedicated exit lane from I-285 that funnels into The Battery Atlanta, these steps will facilitate safe and efficient vehicular and pedestrian travel. Lorens encouraged property owners in the area that are interested in parking vehicles on game day to apply for a permit with the County so they can work them into the overall plan. The Braves also announced they would be able to offer more than 11,000 parking spaces owned or leased by the organization for game day. This is already 2,500 more spaces than were available at Turner Field, all serving a ballpark that features roughly 8,000 fewer seats, with more parking to be added prior to Opening Day. The Braves will begin selling season parking to A-List members immediately, with single game parking to be sold when single game tickets go on sale March 10. The Braves also unveiled plans to launch a private shuttle service that will serve both their managed parking lots and key points of interest in Metro Atlanta. Specific routes will be released closer to Opening Day. In Waze and Uber, the Braves have identified two leaders in transportation technology to help provide for safe, efficient options for fans headed to the ballpark. Waze, the world’s largest community-based traffic and navigation app, will collaborate with the Braves and Cobb County to share data and real-time updates with fans and commuters. Waze currently serves more than 760,000 active users in the Atlanta-Sandy Springs-Gainesville area, and its real-time updates will enhance the data being provided by Cobb County DOT from its on-site traffic control center. Fans will receive directions from their doorstep directly to their assigned parking lot, each of which has its own address. The Braves also shared updates on their partnership with Uber. The ridesharing giant has experienced consistent, strong growth in Metro Atlanta, and this partnership will offer an alternative for fans traveling to the game. 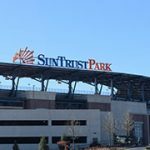 SunTrust Park will feature a designated drop-off/pick-up zone on Windy Ridge Parkway, adjacent to the ballpark, enabling fans to safely and easily find a vehicle following the game. 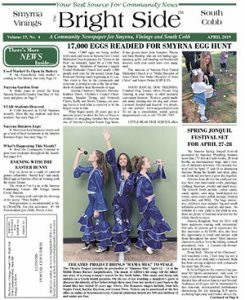 From the February 2017 issue of The Bright Side, Cobb County Georgia’s Newspaper covering Smyrna, Vinings, Mableton, Powder Springs and Austell, GA. 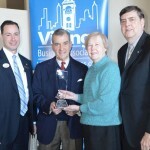 The Vinings Business Association named the Vinings Village Civic Club as its Business or Organization of the Year at the Dec. 2 luncheon. The Vinings Village Civic Club is the oldest civic organization in the village with nearly a century of service, according to Sharon Meinhardt, president. The criteria for the honor involves a partnership with the community, longevity, community support and visibility, explained VBA President Charles Rea. Ms. Meinhardt said she joined the Vinings Village Civic Club three years and one of her first projects was picking up trash on the roads. “I went from picking up trash to president in one fell swoop,” she said. 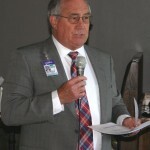 While non-partisan, the group hosts political forums at each election. This year they heard 47 candidates during the forums. In almost 100 years of service, the group has proved that “we mean we care about the quality of life of where we live,” she said. 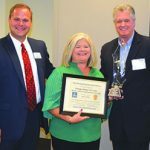 Other finalists for Vinings Business Association’s Business or Organization of the year were Vinings Rotary, Curves for Women, Fidelity Bank, and Grub Burger. From the December 2016 issue of The Bright Side, Cobb County Georgia’s Newspaper covering Smyrna, Vinings, Mableton, Powder Springs and Austell, GA.
Vinings resident Robert S. Meyring is managing attorney of Meyring Law Firm and an avid cyclist who believes that anything is possible with the proper planning. That is the positive attitude he brings to his law practice and also to his commitment to the National Multiple Sclerosis (MS) Society – Georgia Chapter. 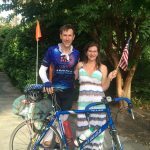 This June, Meyring is saddling up for a solo unsupported five-day, 700-mile bicycle trip from Atlanta to Washington, D.C., to raise funds for his Bike MS: COX Atlanta Peach Ride 2016 team of six years, Amy’s Armor. “This journey allows me to combine three things that I am passionate about: helping others, being a lawyer and bicycling,” says Meyring. Once in D.C., Meyring will be sworn in before the full U.S. Supreme Court as a Supreme Court Bar attorney. That’s a big accomplishment for him, as was completing two 300-mile solo bike rides in the last two years and a two-month cross-USA solo bike tour in 1994. Celebrating its 30th anniversary in 2016, the Bike MS: COX Atlanta Peach Ride is set for Oct. 1-2 and features a new starting line at Blalock Lakes Sporting Club and community in Newnan, an overnight party in historic, downtown LaGrange and the option of a one- or two-day ride. Over 1,000 cyclists of all skill levels will enjoy 30-, 60- and 100-mile route options with beautiful countryside and hospitality along the way. For more information and to register for the October Bike MS event, visit bikemsgeorgia.org. 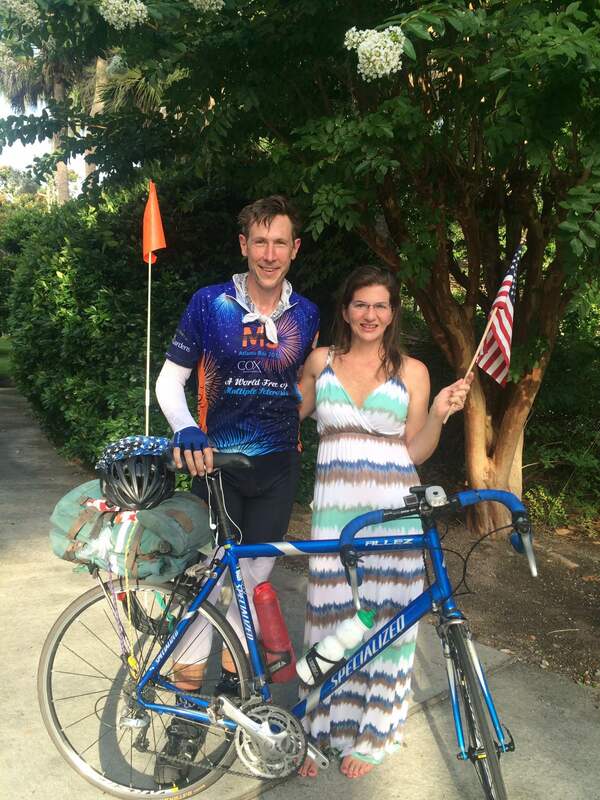 To learn more about Robert Meyring’s June ride to D.C. and contribute to his Bike MS team, visit bit.ly/meypath. From the June 2016 issue of The Bright Side, Cobb County Georgia’s Newspaper covering Smyrna, Vinings, Mableton, Powder Springs and Austell, GA. 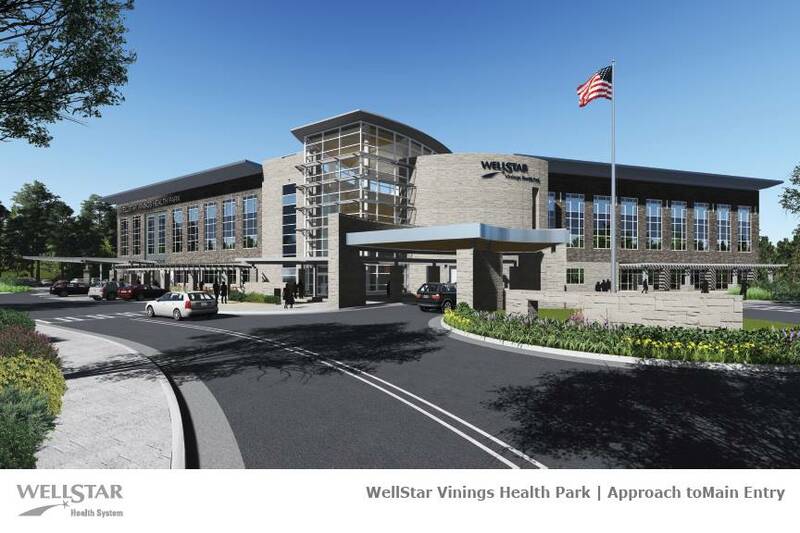 The WellStar Vinings Health Park will hold a groundbreaking event this month as construction begins on the new 162,000 square foot health park at Atlanta Road and Cumberland Parkway. “The ground breaking is coming up Feb. 25,” said Amy Carrier, president of WellStar Cobb Hospital at a recent meeting of the South Cobb Business Association. Plans for the health park in Vinings include a wide array of comprehensive medical diagnostic testing services such as medical imaging, urgent care, lab and pre-admission testing, cardiac and sleep diagnostics, physical therapy and sports medicine, cardiac and pulmonary rehabilitation, pharmacy and community education, health screening and wellness services. WellStar operates similar Health Parks in Acworth, Woodstock and east Cobb. “We are so excited that we are building one in the Smyrna/Vinings area, just outside the Perimeter,” Mrs. Carrier said. Some site preparation work has begun, leveling old buildings and getting the site ready. WellStar is addressing concerns about traffic, lighting and numerous other questions. The facility will be staffed with a multi-specialty mix of physicians to include a strong foundation of primary care physicians – family physicians, internal medicine, pediatrics and OB/GYN -and specialists, such as cardiologists, pulmonologists, ENT, gastroenterologists, surgeons, allergy/asthma, endocrinology and others based on community needs. “It will be very similar to the other buildings in the Vinings area with the stone and wood,” she said. “We will be incorporating the elements of nature into the building has shown a difference in the healing of the patients. The health park’s services will be linked together with all other WellStar facilities via an electronic medical record. This will greatly improve patient convenience and allow for better care coordination for patients. “Inpatient surgical services will be supported by us at Cobb Hospital,” Mrs. Carrier said. From the February 2016 issue of The Bright Side, Cobb County Georgia’s Newspaper covering Smyrna, Vinings, Mableton, Powder Springs and Austell, GA. The Holiday Season kicks off with Christmas Tree Lightings, Santa visits, and food and fun and music for all in the Smyrna-Vinings and South Cobb area. Enjoy holiday festivities and musical performances by school choirs at the Smyrna Community Center and see Santa light the big Christmas Tree on the Village Green at 7 p.m.
Bring the entire family for all of it and ring in the season downtown. This event marks the first official evening of holiday lights in the downtown. Watch Santa light the big Christmas Tree in the middle of the Village Green at 7 p.m. and transform downtown Smyrna with brilliant lights. Enjoy holiday festivities, musical performances by local church and school choral groups, activities for the kids, parade and a visit with Santa at the Smyrna Community Center. This annual event marks the beginning of the season of lights in our downtown. Each evening through the holidays, enjoy the lights downtown. Vinings Jubilee Tree Lighting Thursday, Dec. 3 from 6-8 p.m. in front of the Clock Tower. Tuesday, Dec 1 – Coming Home for the Holidays, Smyrna Community Center 6 – 8 p.m. At the Welcome Center Friday, Saturday and Sunday 6pm to 8 pm. Dec 4,5,6; Dec 11, 12,13; Dec 18,19,20; Monday Dec 20 and Tuesday Dec 21. Contributions are welcome! All proceeds support the Smyrna Public Safety Foundation’s Shop with a Hero program. The Santa House is sponsored by the Smyrna Optimist Club and the City of Smyrna. The City of Austell will hold its Annual Christmas Tree Lighting on Friday, Dec. 4. This free community event will begin at 6 p.m. at Collar Park, 2625 Joe Jerkins Boulevard, adjacent to the City Hall/Police Department Complex. The event is sponsored annually by Mayor Joe Jerkins and the Austell City Council to welcome the holiday season. In addition to the tree lighting, all of the holiday lights in the city will be turned on. Local school choirs will provide musical entertainment. Free hot dogs, hot chocolate, and pastries will be served. Santa and Mrs. Claus will arrive on his sleigh and everyone will have the opportunity to tell him their favorite Christmas wish. For more information, please call 770-944-4309. The City of Powder Springs invites you to an Old Fashioned Christmas Tree Lighting on Friday Dec. 4, at 6 p.m. on the town square lawn in downtown Powder Springs. Join us for Christmas carols, hot chocolate and cookies, and pictures with Santa. 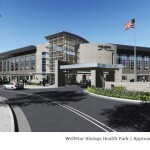 From the November 2015 issue of The Bright Side, Cobb County Georgia’s Newspaper covering Smyrna, Vinings, Mableton, Powder Springs and Austell, GA.
WellStar will break ground on its Vinings Health Center late this year, Reynold Jennings, WellStar CEO told the Vinings Business Association. 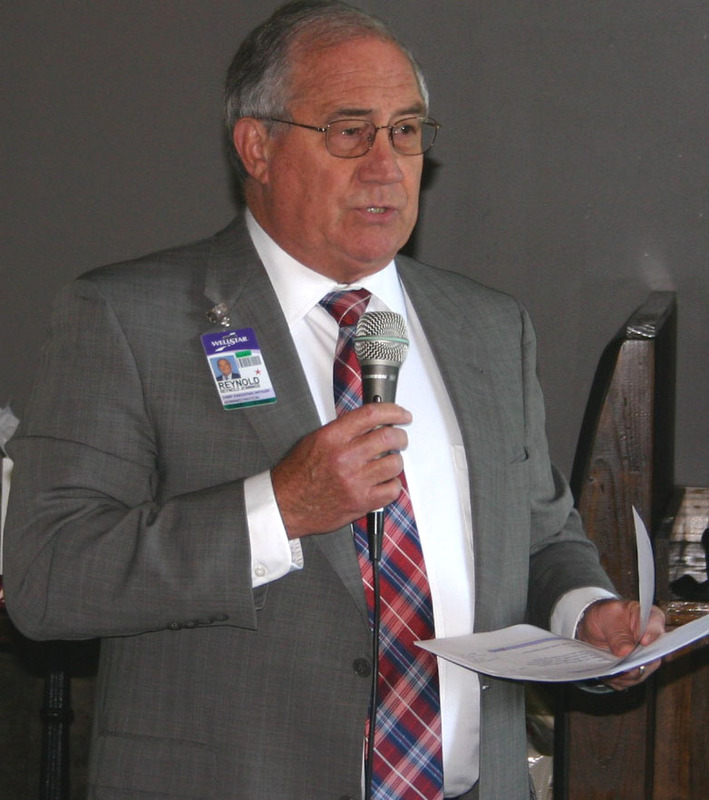 “We will start construction in December on the Vinings Health Park,” he said at the May 5 meeting. The WellStar Vinings Health Park, on 25 acres of property bordering I-285 to the east, Atlanta Road on the south and Cumberland Parkway on the north, will feature a 162,000 square foot outpatient facility and doctors’ offices in the Smyrna/Vinings area. The first health park opened in Acworth and the new facility will be similar to one in east Cobb, but on a larger site. Jennings hinted that additional expansion might be available at the Vinings campus. Estimated cost for the new health Park is $68 million, according to Joe Brywczynski, senior vice president health parks development. From the May 2015 issue of The Bright Side, Cobb County Georgia’s Newspaper covering Smyrna, Vinings, Mableton and Austell, GA. The Vinings Business Association will host its sixth annual Vinings Business Expo, March 10 from 4 – 7 p.m. at the Courtyard Atlanta Vinings Hotel, 2857 Paces Ferry Road, Vinings. Admission and parking are free and the event is open to the public. Over 30 exhibitors will be featured with information on Vinings-area businesses and events. There will also be free food samples, door prizes, drawings and giveaways, including restaurant gift certificates and a cash bar. Association chair Glenn Christian said he expects 500 people or more to attend this year’s event. Sponsors of the events include, The Bright Side News Vinings Edition, Courtyard Atlanta Vinings Hotel, Fidelity Bank, High Calibre Realty, PC Doc USA, Fidelity National Title, Edward Jones Co., and many others. Exhibit tables are $125 for members and $195 for non-members, and all exhibitors must register and pay in full in advance, online only at www.viningsbusiness.com. Exhibitor setup is from 3 to 3:45 p.m. on a first-come, first-served basis. Interested businesses, organizations or individuals can sign-up to be exhibitors as long as the link on the association’s website works (it will stop working once 30 have signed up), Christian said. Membership in the VBA begins at $95 for 12 months and can be set up online with a credit or debit card. Information: (678) 725-0099, email glenn@viningsbusiness.com or visit www.viningsbusiness.com. From the February 2015 issue of The Bright Side, Cobb County Georgia’s Newspaper covering Smyrna, Vinings, Mableton and Austell, GA. The Vinings Business Association will host its fifth annual Vinings Business Expo, April 21 from 4 – 7:30 p.m. at the Courtyard Atlanta Vinings Hotel, 2857 Paces Ferry Road, Atlanta. Admission and parking are free and the event is open to the public. More than 30 exhibitors will be featured with information on Vinings-area businesses and events. There will also be free food samples, door prizes, drawings and giveaways, including restaurant gift certificates and a cash bar. Association chair Glenn Christian said he expects 500 people or more to attend this year’s event. Exhibitor tables are $125 for members and $195 for non-members, and all exhibitors must register in advance, online only at www.viningsbusiness.com. Setup is from 2:30 to 3:45 p.m., and exhibitors must park directly across the street in the garage after unloading. Interested business can sign-up to be exhibitors as long as the link on the association’s website works (it will stop working once 30 have signed up), Christian said. Membership in the VBA begins at $95 for 12 months and can be set up online with a credit or debit card. From the April 2014 issue of The Bright Side, Cobb County Georgia’s Newspaper covering Smyrna, Vinings, Mableton and Austell, GA.
“Vegas in Vinings,” presented by The Vinings Historic Preservation Society, returns to The Vinings Club on Feb. 22, at 7 p.m.
Come strut your Vegas attire in Denim or Diamonds and try your hand at the gaming tables including Blackjack, Roulette, Craps, and Poker. Tickets are $100 for VHPS members and $125 for non-members. Couples who would like to get a head start to the gaming tables with “High Roller” check in may purchase a PAIR package for $500. Tickets include a bountiful buffet, two drink tickets at the open bar, two raffle tickets, and $2,000 in fun money to spend at the tables. Tickets are available now on the VHPS website: www.vinings.org. For more information and for sponsorship opportunities, contact Gillian Greer at 770-432-3343 or email vhps1874@bellsouth.net. From the January 2014 issue of The Bright Side, Cobb County Georgia’s Newspaper covering Smyrna, Vinings, Mableton and Austell, GA.
Todd Ash, VBA President, left; John Sherholtz; and Bright Side Publishers Cathy and Allan Lipsett. 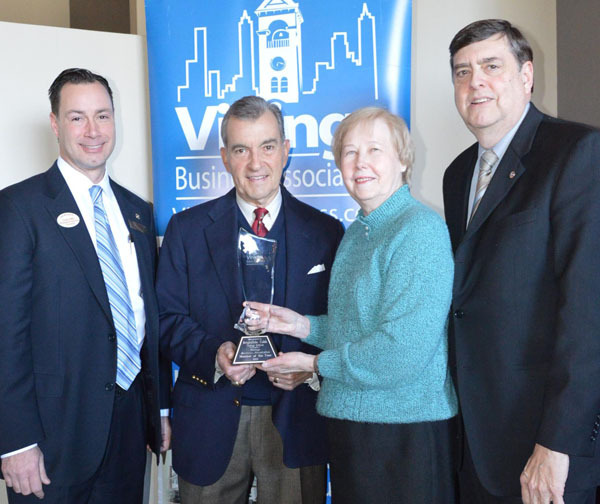 The Vinings Business Association named The Bright Side as the 2013 Business of the Year. Other finalists included, Delmar Gardens, PrintWave, Social Vinings Restaurant and the Courtyard by Marriott Atlanta Vinings Hotel. Cathy and Allan Lipsett are beginning their 10th year publishing The Bright Side, a monthly good-news publication of the Smyrna-Vinings area. The winners were presented with a trophy designed by Lillie Glassblowers. “This is a great honor, and we are glad to be here covering the Vinings community and the Vinings Business Association,” said Allan Lipsett. Previous winners were Akers Mill Chick-fil-A, 2006; SOHO restaurant, 2009; Courtyard Atlanta Vinings hotel, 2010; Vinings Jubilee, 2011; and Vinings Historic Preservation Society, 2012. A sell-out crowd of 90 packed the room to hear Atlanta Braves President John Sherholtz, speaking on the team’s move to Cobb in 2017. “We will set a new standard for major league stadiums,” Sherholtz said. Team officials are talking with designers and architects now about the stadium plans as well as a mixed use development of retail shops, restaurants and entertainment that will allow fans to get ot the stadium early, spreading out the traffic pattern.